I was drawn to Countess of Seville in store when the salesperson told me that it was a green tea version of Earl Grey. Well, sign me up! 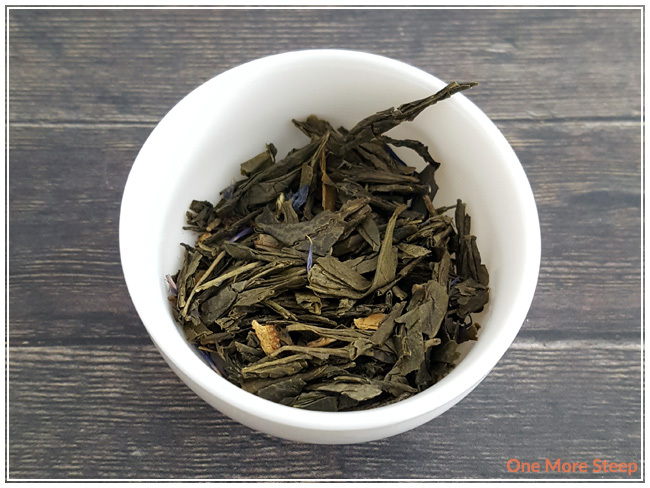 It’s a green tea with orange and bergamot oil, so it does have an added twist from the traditional Earl Grey beyond the change in tea base. Countess of Seville has a strong citrus fragrance to it, it’s hard for me to differentiate the orange oil from the bergamot oil. It smells overall very fresh, light, and full of citrus flavour. The tea leaves are uneven in size, and the tea has dried blue cornflowers. The ingredients in Countess of Seville are: organic green tea, orange peel, cornflowers, orange oil, and bergamot oil. 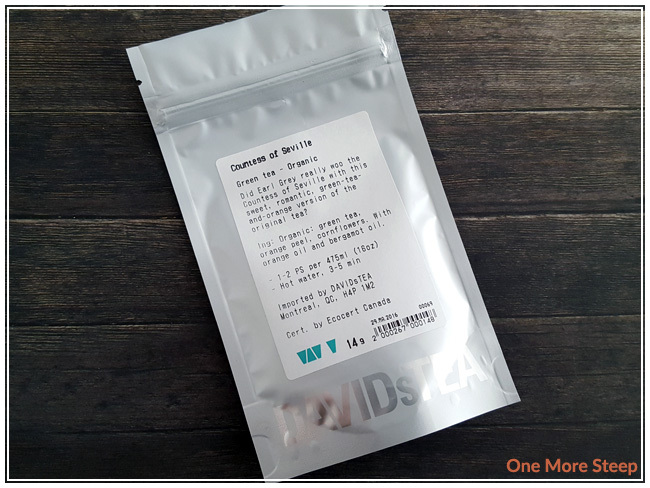 DavidsTea recommends steeping Countess of Seville in hot water for 3 to 5 minutes. “Hot water” is 75-80°C (167-176°F) on their product page. I opted to steep for closer to 2 minutes 30 seconds, as I loathe over steeping green tea. Countess of Seville steeps to a pale yellow, and it has a very light, fresh citrus scent to it. When sipping the tea, I’m happy to report that there is a nice sweetness to the tea itself, and I don’t think that any added sweetener is needed for this one. The green tea base is pretty much lost with the orange and bergamot oils. Countess of Seville is a nice light tea though, thoroughly enjoyable and a pleasant cup. 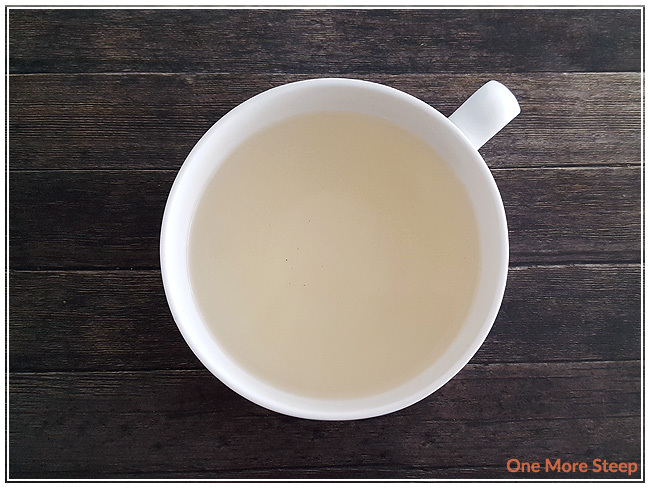 I would not opt to steep this one to the higher end of the recommended time range (5 minutes), I would consider that to be fair too long for a green tea and you’re likely to wind up with a bitter cup of tea. I attempted to resteep Countess of Seville and wound up with a muddled cup of tea that doesn’t have nearly the level of citrus punch as the first steep did. I wouldn’t recommend Countess of Seville for one more steep. I liked DavidsTea’s Countess of Seville. I tend to really enjoy Earl Grey teas, and I did find Countess of Seville to be a nice cup of tea. 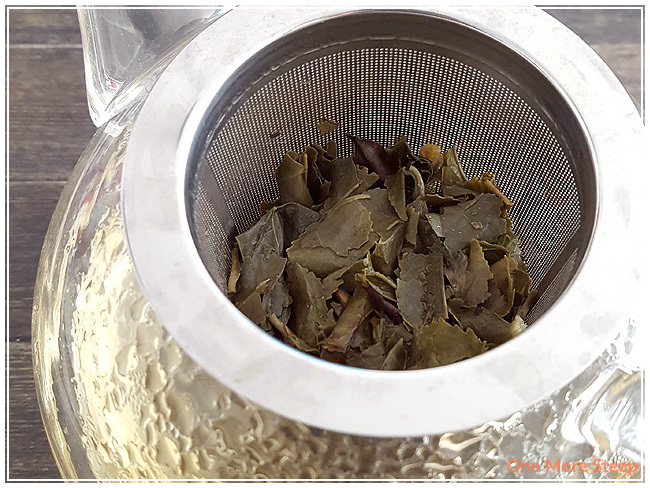 I think it would be better if the green tea that was used as the base of this tea was more flavourful or stronger to balance with the citrus oils that had been added to it. Overall, I think that Countess of Seville is a nice tea and I would drink it again. It would be a nice tea option to have for a tea tasting party, I think, because not a lot of people would be familiar with a green tea version of an Earl Grey.